The weather today in the Everglades today was perfect; sunny and warm . With the snook moving from the backcountry, on to the outside points, the fishing has been great. 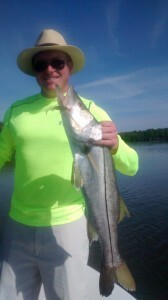 This is one of several nice snook we caught today south of Everglades City, near the Chatham river area . April and May are two of the best months for fishing in the Everglades, so don’t miss out on some great action! Give me a call, and let me get you out on the water for a great day of fishing!